In today's world of competitive tennis, athletes do a lot more all-around conditioning than in years past. Players like Novak Djokovic and Rafael Nadal epitomize an elite level of fitness. Their battle in the 2012 Australian Open final lasted a mind-boggling 5 hrs and 53 minutes. (Djokovic won.) And I don't think I've ever seen Roger Federer breathing heavy after a long rally. What's his VO2max anyway?!! Martina Navratilova was legendary for how hard she worked on her fitness. Lindsay Davenport, Andre Agassi, and Martina Hingis each made a resurgence after working on their fitness in the second half of their respective careers. The top tennis players have superb aerobic conditioning. In 2014, Caroline Wozniacki ran the New York City Marathon in 3:26. She had never done a training run longer than a half-marathon! But anaerobic conditioning is just as important in tennis. Steffi Graf was literally world-class here: In 1988, she won the Grand Slam, and, also an Olympic gold medal in tennis, achieving what is called the "Golden Slam." While at the Olympics, the German track coach timed her in a 400-m dash. Her time matched that of the German 4x400 track athletes! • Biking: No doubt, riding a bike can boost your aerobic fitness: Tour de France cyclist Greg LeMond had a VO2max of 92-94 ml/kg/min, second only to the world's highest value of 96 by legendary cross-country skier Bjorn Daehlie. However, cycling doesn't train the legs like running does. Running develops not only the front of the thighs, but also, it develops the back of the thighs (hamstrings), and muscles of the feet and lower legs much better than biking. • Running: Generally, the best form of aerobic conditioning for tennis involves running. Both tempo runs and intermediate-distance running should be included in the weekly routine. Running distances of 10-K or half-marathons isn't necessary. Develop your cardiovascular capacity by running distances of 1-2 miles at a relatively brisk pace. Mix in some quarter-mile runs at near-maximal effort. • Shuttle Run: However, tennis requires more than simple straight line running. An excellent running drill for tennis is the modified shuttle run: Run from the fence to the base line, then back to the fence. Next, run to the service line, and back to the fence. Then run up to the net, and back to the fence. This up-and-back cycle can be repeated over and over uninterrupted. To add variety, hold your racquet while doing this drill. Another variation is to face towards the net while running both up and back (ie., this involves alternating between forward and backward running). • Agility / Mobility Drills: Agility and mobility drills are also important. These will develop your quickness around the court. One way to do this is to start by standing in the center of the court (ie., on the "T"). From this center point, run to one of the 4 corners of the court, then, back to the center, then to a different corner of the court, then back to the center, and so on. At each corner, touch your fingers to the ground. This will get you used to bending low for volleys and ground strokes. You should do this 4-corners drill while always facing towards the net during your trek to each corner. This will mimic what you need to do when moving forward at an angle to cut off a volley, and will emphasize proper positioning when retreating to the back court. Doing this 4-corners drill while always facing forward requires you to run at angles, both forwards and backwards. This drill will also enhance your ability to change direction, something that occurs constantly in a tennis match. Once you have developed your fitness, have your partner hit a ball to each corner and see if you can return it. This will force you to get in proper hitting position when you reach each corner. Want to make these agility drills even harder? Wear a weighted vest while you do them! • First, make sure your hitting partner is good at feeding balls and start with several hoppers. Your partner will be feeding balls, but not trying to return them. • Begin at the baseline. Your partner should start by feeding 2 balls to your backcourt, setting you up to hit 2 ground strokes. You should drive these balls deep, to opposite corners. Approach the net after hitting the 2nd ground stroke, but only if both of your shots landed in. If either goes long or into the net, keep hitting ground strokes until you hit 2 in a row that stay in. • Next, your partner should feed you 2 balls that you can volley, one from each side. After you hit the 2nd volley, touch your racquet to the net and begin retreating to nail an overhead. • Your partner should hit a lob towards the center of the court. Take this out of the air with a firm overhead (don't nail your partner!). • Move in again as your partner feeds you a ball that you can volley away for a winner. • Now, run back to the baseline and start the whole series over. No resting! This drill goes on continuously until you run out of balls, or, are completely exhausted. It's a tough drill, but it simulates match play. John McEnroe, in his prime, kept his game sharp by playing lots of doubles matches with Peter Fleming but did very little weight-training. Even though a tennis racquet isn't heavy, weight training is now considered a core element of a serious tennis program. When Andre Agassi wanted to take his game to a new level, he hired strength coach Gil Reyes to be his personal trainer and installed a complete gym in his house. He began weight-training and eventually regained the world's number 1 ranking in 1999 (and probably would have held it for several more years, had it not been for one minor detail: Pete Sampras). • Dumbbell Exercises: Dumbbell exercises are ideal for tennis players. Exercising the dominant shoulder with windmill circles while holding a light dumbbell will improve the muscles used for serving and hitting overheads. Doing wrist curls will improve forearm strength. Bench press and flye exercises will improve the forehand and forehand volley. • Cable-pulls are a great way to improve arm and shoulder strength for hitting ground strokes. These exercises allow for a wide range of motion which recruits a variety of muscles used in the tennis stroke. 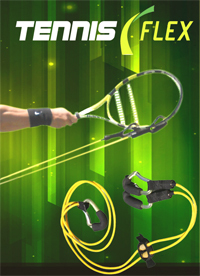 • Forearm and Grip Training: Tennis Flex allows you to train your forearm and grip muscles while holding your own racquet. 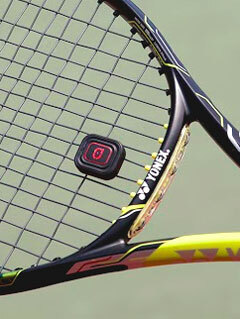 It attaches stretch bands to the frame of your racquet; the other end of the bands is attached to a firm anchor. Then, you perform your strokes. Trust us: this will really make your forearm muscles burn! Learn more about it here. • Core Training: A really important part of resistance training for tennis is core training. The serve and the overhead require a lot of strength from the abdominals and the obliques. Crunches on the floor or using a stability ball are ideal for this. But don't forget to incorporate twisting crunches so that you can train those important obliques. • Plyometrics: Once a good base of leg strength and cardiopulmonary conditioning has been achieved, add some plyometric exercises (see related story "Plyometrics"). Plyometric jumping exercises will help you jump up and back to nail that overhead smash. If you find plyometric jumping exercises like this boring, consider playing some 2-man sand volleyball. You'll get a fantastic workout and not even realize that you are doing those very same plyometric jumps. Soccer and basketball are highly aerobic and provide conditioning in a manner that closely mimics movements in tennis. Swimming, in particular the crawl, is an excellent exercise for strengthening the muscles used in the serve and the overhead. Swimming involves lots of repetitive movement against minimal resistance, which helps to build muscular endurance. Martial arts can fine-tune your balance and timing, which helps the net game in tennis. Basketball is good for maintaining agility, leg strength, and aerobic conditioning. Martina Navratilova loved to play basketball. Soccer is also a great aerobic compliment to tennis (just ask Rafael Nadal!). Volleyball can develop reflexes and hand-eye coordination. And yoga is another activity that tennis players should consider. However, tennis players should avoid badminton, pickleball, racquetball, and squash. In my opinion, playing these sports really messes up your tennis game. The short-handled racquets in pickleball and racquetball force you to snap your wrist, which is generally what you are trying to avoid when hitting a solid ground stroke in tennis. And badminton and squash racquets are a lot lighter than tennis racquets. If you get used to these lighter-weight racquets, this will hurt your timing in tennis. In July 2015, we learned of a cool gizmo being developed that will give you detailed information on your strokes: the "QLIPP Tennis Sensor." NOTE: As of September 14, 2017, their web states that the expected release date for this device is late 2017. The anticipated retail price of the sensor is $129. For more information, see: www.qlipp.com. • Human Performance Institute, Orlando, FL (www.HPInstitute.com): The Human Performance Institute (formerly known as "LGE Performance Systems") has been training pros and serious players. Led by Director of Tennis Lorenzo Beltrame, HPI has trained Jim Courier, Monica Seles, and Pete Sampras. • Saddlebrook Resort, Wesley Chapel, FL (www.Saddlebrook.com): Harry Hopman was the coach of Australian greats Rod Laver, Ken Rosewall, and John Newcombe. When Hopman came to the States, he set up his rigorous tennis program at Saddlebrook, just north of Tampa, FL. Although Mr. Hopman has since passed on, his program and philosophy remains. Jennifer Capriati and Martina Hingis have trained here. I trained there a couple years ago. Each day, we were on the courts for 5 hours per day. I loved it. • Bollettieri Tennis Academy, Bradenton, FL (www.IMGAcademies.com): As described above, Nick Bollettieri is a legendary coach. The list of current and former touring pros who have trained here is very impressive, most recently, Maria Sharapova. The Academy, part of the IMG Academies network, offers a variety of junior programs. 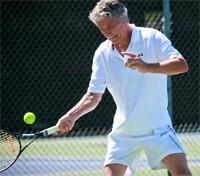 • Rick Macci Tennis Academy, Boca Raton, FL (www.RickMacci.com): Rick Macci is a 7-time USPTA Coach of the Year. He has trained Venus and Serena Williams, Jennifer Capriati, Mary Pierce, Andy Roddick, and other touring pros. Even if you're not interested in competing in tennis tournaments, at the very least, tennis is an excellent aerobic exercise. When playing singles tennis, the average player burns about 7-8 times the calories used while sitting. 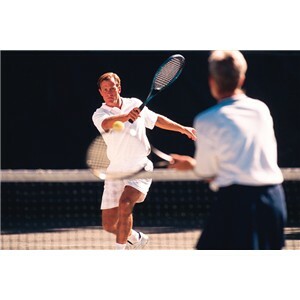 Doubles tennis burns about 5-6 times the calories used at rest (Ainsworth BE, et al. 2011). If you like tennis, and you're more concerned with getting in shape than competing, consider a Cardio Tennis class. Cardio Tennis (www.CardioTennis.com) is a concept that blends aerobics with tennis. It's certainly bound to be more fun than jogging. 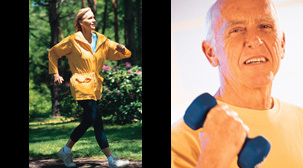 Please consult with your physician before beginning any new exercise program. Q: How much weight should I lift if I want to add weight-training to my tennis program? ANSWER: Tennis players need to develop muscular "endurance" more than muscular "strength." The key principle in developing muscular endurance is to keep the weight low enough so that during each set, you can do 15-20 reps. This concept is explained more thoroughly in the review "Resistance-Training Principles Part 1: The Basics". The USTA has a page of useful exercises here: www.USTA.com. In addition, the USTA, in conjunction with Human Kinetics, has produced a DVD on Dynamic Tennis Warm-ups. This DVD outlines the importance of a warm-up for tennis players and presents 30 different exercises, as part of three routines, that can be incorporated into an effective warm-up.